Milwaukee is coming out with a brand new line of 12" miter saws. They are looking to step up from their 10" line. The saws are set to go on sale early in July, which is surprising considering how little information there is about them. The 12" sliding compound miter saw 6955-20 will cost $700, and the non-slider 6950-20 will be $500. There are a few things that do make these saws unique. They have 2 built in lights to illuminate your material, and they are the first contractor saw to offer a digital miter degree readout. You can see one light just to the side of the blade, and I would assume it would be the same for the other side. The digital miter readout can also be seen, just in front of the miter control handle. One thing I do not see in the above photo, is the rails that the sliding compound miter saw slides on. 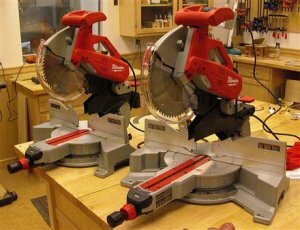 This saws looks to be very promising, so if you are in the market for a new 12" miter saw, you will definitely want to wait a month, and check these out.